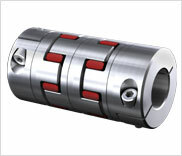 ROTEX® GS is a 3-part, axial plug-in coupling backlash-free under pre-stress. It is convincing even with critical applications by its backlash-free power transmission, its stiffness which is each adapted to the application and its optimum damping of vibrations. This principle of installation offers significant assembly possibilities which optimize the assembly times in production.